jazzoLOG: We've Changed Earth's Climate: Now What? That which man acquires by contemplation he should spend in love. Mark Twain's famous remark remained funny for about a hundred years. Then we began to wonder. With all our technology, why can't we change the weather in some places if we want to? But at the same time, gloomier forecasts were accumulating that in fact humanity, in that same hundred years of industrialization, was changing not only the weather but the very stability of the planet's current climate arrangement. We've had at least 10 years of raging argument about this, and still we have "scientists," mostly in the pay of corporations who can't find a profit motive yet, who tell us it all is too complicated for people to understand and it's better to do nothing. Most people, in the States anyway, seem to believe there's global warming or whatever we end up calling it, but feel it's too big for them to change any behavior about. I mean, what is one guy supposed to do? "Perhaps the most visible sign that Earth’s climate is warming is the gradual shrinking of its glaciers. In North America, the most visited glacier is the Athabasca Glacier, one of six glaciers that spill down the Canadian Rockies from the Columbia Icefield in western Canada. Visitors who return to the glacier a few years after their first visit will notice the change wrought by warming temperatures. 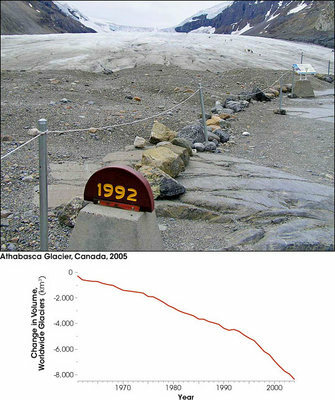 In the past 125 years, the Athabasca Glacier has lost half of its volume and receded more than 1.5 kilometers (0.93 miles), leaving hills of rock in its place. Its retreat is visible in this photo, where the glacier’s front edge looms several meters behind the tombstone-like marker that indicates the edge of the ice in 1992. The Athabasca Glacier is not alone in its retreat: Since 1960, glaciers around the world have lost an estimated 8,000 cubic kilometers (1,900 cubic miles) of ice. That is approximately enough ice to cover a two-kilometer-wide (1.2 mile-wide) swath of land between New York and Los Angeles with an ice sheet that is one kilometer (0.62 miles) tall. "Melting glaciers, dwindling sea ice, rising global temperatures, and rising sea levels. Little by little the evidence is adding up to show that Earth is getting hotter, and scientists are almost certain that people are to blame. A number of activities from burning fossil fuels to farming pump heat-trapping gases—greenhouse gases—into the atmosphere. Once in the atmosphere, these gases stay there for thousands of years, absorbing the heat that comes from the Earth and re-radiating it back to the surface, enhancing Earth’s natural greenhouse effect. Between 1906 and 2006, the average surface temperature of the Earth rose 0.6 to 0.9 degrees Celsius (1.08 to 1.62 degrees Fahrenheit), while greenhouse gas concentrations reached their highest levels in at least the past 650,000 years. Most climate scientists believe that there is a connection and warn that if greenhouse gas emissions continue, temperatures are likely to go up 2 to 6 degrees Celsius (3.6 to 10.8 degrees F) by the end of the 21st century. "While this might seem like a small change, it will probably lead to big changes in the environment. Warming temperatures will likely lead to more frequent heat waves, bigger storms, including more intense tropical cyclones (hurricanes), and more widespread drought. Since water expands as it heats, and melting glaciers and ice caps have dumped more fresh water into the world’s oceans, sea levels have already started to rise. Higher sea levels lead to more erosion and greater storm damage in coastal areas, many of which are densely populated. As much as 10 percent of the world’s population lives in vulnerable coastal regions that have an elevation less than 10 meters (32 feet) above sea level." At that point, in a move not at all typical of this site---and I visit it everyday---the reader is referred to another page where begins a lengthy treatise on Global Warming. It is illustrated with many striking photos, maybe most of them taken from satellites circling the Earth. [link] Well, it's a dot gov site, so where's the policy? Must we wait for the dot coms to sell us stuff to solve it? How organized are all the dot orgs? Is the species finished? Groups are beginning to meet across the land, many of them in churches, and the concern seems to be the first issue since 9/11 that crosses all political boundaries. They've spent the last year looking at the videos and DVDs and hearing the speakers, and now comes the time to figure out what to do. At just this moment, a writer named Garret Keizer from up in Vermont has gotten an essay published on the Notebook page of the June Harper's. Put his name with "climate" into Google this morning, and stand back. I think the magazine arrived in our mailbox the same day Earth Observatory put up that photo, and already the Internet is buzzing about what this guy's got to say. Essentially his message is nothing could be worse than if liberals trot out their usual package of reforms, then go back to their decks and patios overlooking the manicured sward, and end up wondering in 20 years why everything is worse than before. Harper's undoubtedly will get this essay online, but they like to wait a couple weeks so that people actually give them some money at the newsstands. Bits and pieces already are emerging in the blogs and I'll give you a taste of those excerpts in a minute. But first, who is this Keizer dude? A fairly detailed outline of his life appeared a couple years ago in the Vermont "alternate web weekly" called Seven Days. [link] Here we learn he grew up in New Jersey, attended the University of Vermont where he got a master's in English, and settled around Burlington, where he taught the subject in high school for 17 years. In the meantime he married a Catholic girl and, not wanting particularly to abandon his Protestant perspective, he got her to attend the Episcopal Church. They asked him to give a sermon and then to take charge of some services, and eventually the church ordained him, even though he never went to divinity school, so he could manage activities in some outlying parishes. He quit teaching partly because of all this, and his own writing became increasingly involved with morality. Christianity Today has 35 articles by him. [link] In his mid 50s, Garret Keizer may find his quiet life around the Vermont town common suddenly disturbed by the kind of notoriety you get when you seriously rock the boat. This pretense of not knowing what every idiot knows has increasingly come to define our national discourse. To say, by way of example, that it has characterized the protracted denial of global warming is to understate the point. It also characterizes the burgeoning acknowledgment of global warming, the willingness to grant that a crisis exists even as our key players scramble to guarantee that every systemic cause of that crisis remains intact. It characterizes our farcical debate over the timetable for the withdrawal of US troops from Iraq even as permanent bases are constructed in that country to oversee the flow of its denationalized oil to our national snout. The intestinal tipping point came for me when a contingent of students from Middlebury College (annual tuition and fees $44,330) found both the gas money and the gall to drive to the town of Sheffield (annual per-capita income $13,277) in order to lecture the provincials on their responsibility to the earth and its myriad creatures. Not to be outdone, a small private school in our area (annual tuition and fees $76,900) has challenged the wind projects as a source of noise disturbance for its special-needs students. This could actually turn the tide. Like a bookie assessing the hindquarters of horses, I've learned to place my bets with a sharp eye on tuition and fees. Don't tell me where you went to school; just tell me what it cost. Gore speaks of the need for "a different perspective" ... But this is the old perspective: the race to the moon, the triumph of the will, the forward march of progress on a goosestep and a prayer. The unquestioned belief that the answer to every human dilemma and desire is a gizmo -- in short, the very attitude that gave us global warming to begin with. Those measuring the ice shelf in Greenland would do well to spend a few weeks measuring the time that typically elapses between any mention of conservation and the quick segue to something sexier; that is, to something you can buy or sell. The abolition of obscene excess, the equitable distribution of finite resources -- these have the same appeal for our movers and shakers as adopting a crack baby has for the infertile members of their club. We have all these wonder-working technologies, all these clever schemes for producing the golden eggs -- or you could always take home little Bernice. But that's going to be a lot of work. Presumably this is not the same greed that inspired ExxonMobil to wage a campaign of disinformation about climate change. Presumably we might also consider redirecting the primal human impulse of hate. We could get the Ku Klux Klan to buy "offsets" for lynchings in Mississippi ... It's the Devil's old remedy: If you're being poisoned to death, try taking more poison. To put that as succinctly as possible, the days of paradise for a few are drawing to a close. The game of finding someone else in some convenient misery to fight our wars, pull our rickshaws, and serve as the offset for our every filthy indulgence is just about up. It is either Earth for all of us or hell for most of us. Those excerpts are taken from a blog that Grist runs, and as of this morning there are 46 comments raging there. [link] Since other bloggers are having a similar experience, maybe a dialogue will start right here. Here's Harper's to watch for the post online [link] . avoidance of doing anything resembling work" - the up shot of this non work "ethic" could well be, the swing of the pendulum of actions past and future, could be a deal of un paid work for everyone! towards earning a keep on planet Earth. PS: Also There is alot of stuff going on in China. If its economy overheats to stop, no one will be able get any computer hardware until the west rebuild their factories, and then they will be quite costly. This was front page on the Financial Times paper on Friday last. A million new stocks are created every day on the chinese stock market "because the chinese like to gamble" despite warnings from the chinese gov to them to reign back for fear of collapse. PS: There are two hot off press articles on Aforestation and Deforestation on my current log if there has not been time to check them out. Basically the forests cause the rainfall, and there are places in the oceans with the climate of the Sahara desert, but no one lives there to find out. Founder/Director Andrew Mitchell, quite a star speaker, of GCP (formerly of Earthwatch) says Forests will be high in the political agendas worldwide next year. the replies I'm getting by email indicate the "war on terror" remains the issue to be cleared up first. Unending war or doomed planet? Life seems to resemble increasingly those 1950s sci-fi movies we created in both the States and Britain. Thank you Nraye for noticing the essay's emphasis on actually DOING something. This may be an "alien" notion to many liberals who seem to think attending a myriad of meetings with peers about their light bulbs at home is doing their part. Creating thousands of tax-funded agencies back in the '70s did little to win the War on Poverty...a "war" as ridiculously managed as this new one (on "terror"). Good news: just got a note from Quinty that he's back from Europe---where he's probably been lolling about while we've struggled on here. He deserves les vacances though. When he gets past his jet lag and pile of emails, maybe he'll come in here and get things stirred up again. Onward. Ill let you wallow in your self imposed demize. Thanx for the links, bush. Any wallows on the horizon for Arizona? seems the feds want to hold back or fine the state 1 billion dollars of hyway funds, because our particulants or dust levels are so high, more BS, like they want us to pave the entire desert or something, maybe spray it down with some plastisizer, since they cant put it in animal feed anymore. Let the king taste the citezens food before we eat it, lol. "The Great Global Warming Swindle". agenda is more a political one than an environmental one. "commentators" are pro the accepted global warming theory. It's 1 hour 13 minutes long, so make yourself comfortable. his critics - who are already mounting a counter-attack. society - as if we didn't have enough already! against the basic thrust of the propaganda. Watch it - and spread the word! Vaxen's posts often pack a Libertarian message somewhere in the baggage, and his presentation of MacGregor here tips his hand more than usual. If you're tempted, as I believe Dietrich Bonhoeffer warned in 1930s Germany, to go below, shut down the hatches, and drift, MacGregor is your man. Here is his "Manifesto For Personal Secession" from 2004 http://theautonomist.com/autonomist/articles2/escape.html and a new deal he's selling to get out of taxes and build personal wealth http://www.sovereignlife.com/ . As for the Swindle documentary, here's its webpage http://greatglobalwarmingswindle.co.uk/ and a scrupulously annotated article about it at Wikipedia http://en.wikipedia.org/wiki/The_Great_Global_Warming_Swindle . Woe to you who are poor, because you're most likely going to stay that way. You might be compensated for your suffering in the hereafter, and more power to you if you are. But in this life, in these United States of America, you are royally fucked. * Three out of four U.S. workers have experienced a decline in their standard of living over the last 20 years: either a drop in purchasing power, a loss of benefits, or a change in job security. *Between 1996 and 2005, the total combined net worth of the Forbes 400 increased from almost $500 billion to $1.13 trillion--a 137% gain. During that same time, median weekly earnings for fulltime, non-supervisory workers grew at annual rates between 1.8% and 5%. But before you get too excited, keep in mind that the inflation rate during this same period ranged between 1.4% and 3.5%. * In 1986, 95% of employees at medium-sized and large firms had employer-provided health insurance. Today, the percentage is 59.8%. Retirement benefits for the same group over the same time period dropped from 89% to 60%. * Between 1979 and 2003, the real family income for the bottom income quintile dropped by 2%; the second quintile rose by 8%; the third quintile rose by 15%; the fourth quintile rose by 26%; the top quintile rose by 51%; and the top 5% of the top quintile rose by 75%. * The number of "severely" poor in this country is increasing. In 1975, they were 30% of the population living below the poverty line. Today, they're 43%. * The number of "abjectly" poor in this country increased by 26% between 2000 and 2005. * The average U.S. CEO makes 431 times the average salary of one of his or her employees; this is down from a high in 2000 of 525 times. * The three richest people in the U.S. have assets that exceed the combined Gross Domestic Product of the 57 poorest countries. "Those who oppress the poor insult their Maker," says Proverbs (14:31). God sees, and God remembers. Do those of us who have too much--with "us" referring to individuals as well as institutions (with churches at the top of the list)--really think there will be no Day of Reckoning? Unlinked data are taken from United For a Fair Economy's books Teaching Economics as If People Mattered and Economic Apartheid in America and from the Poverty in America project. Opened almost all Links here. Very good documentary from Vax, and yes there would appear to be no doubt at the political manoeuvring of poor scientists' finding on the cause of GW. It was the sun spots all along. Have also read all your post, Jazzolog, on current standards of living in US in comparison to 20 years ago. However, there is still the problem of a reduction of rain fall and unreliable seasons harming food production, and large migration of peoples from dry areas, the Sahara increasing etc. Just because GW is politicised and draining much needed funds from elsewhere, the effect of real GW is still here. And we have to reduce dependency on oil coal etc to cleaner alternatives. So, again the oceans have a 10,000 year memory prior to knock on effect, why I am not surprised? Also the Solar winds caused by increased magnetic activity thro sun spots is a major cause of MOVEMENT which brings me back to an over production of Linear time frame phenomena, which will automatically increase HEAT. However, I still maintain that Arcadia is the articulation of the Wilderness - and there has to be enough of the green Wilderness to sustain the human race by giving natural wildness to counteract the ever increasing rationalisations produced by our "Civilised" manipulated life styles, as witnessed in the Docu above. This is one log to which I will return, more than once to ingrain and understand more fully. A real window onto a misnomena of vast scale. Thank you so much. However here is a link wherein you can find plenty: http://www.au.af.mil/au/awc/awcgate/awc-thkg.htm So please don't be hesitent in using it. It is much more than 'Sun Spots.' I can assure you that there is one humongous coverup going on where weather warfare is concerned but, as is always the case, there are 'whistleblowers' around who actually do 'KNOW' the program and are more than just a bit concerned. How about that Congress! The one 'party' system with the face of Janus. Ah, know that project? "Project Janus?" In the meanwhile just go with the flow and extricate yourselves from 'that system' as much as possible and get knowledgeable about living 'off the grid' as much as is humanly feasible. Another great link that will give you, not only 'food' for thought, but also 'ways and means' of communication, and confrontation, is: http://www.oss.net/ Contrary to 'popular' opinion we can win, win, win, this...thing. I guarantee it! 1) Media Coverage. Public intelligence can be shared with the public, and by crafting current and estimative intelligence for each Congressional Committee, we can put the Chairman and Ranking Member on CNN or any other channel with high-value relevant intelligence about any of the ten threats, twelve policies, and eight players that will define the future. 2) Level Playing Field. Congress has asked for secret intelligence support to all the jurisdictions. That will not happen, nor should it. The secret world does not know anything truly useful to Agriculture, or Commerce, or any of the other important non-secret policy domains. In combination, the Congresssional Public Intelligence Office (CPIO) and the Open Source Agency (OSA) will level the playing field between the legislative and executive branches. 3) Constituent Service. The federal budget is out of control, and too much of the hard-earned taxpayer dollars is going to a heavy metal military we do not need and cannot afford, and to very expensive and largely ineffective secret technologies and "butts in seats." Reform can be job and revenue neutral state by state and district by district. In both the short and the long term, Congress can double the returns on the tax-payer dollar by adopting reality-based budgeting, something the Comptroller General has been pleading for. All over the world foreign intelligence communities that do not have the $60 billion a year budget of the USA for secret intelligence are completely re-designing their total intelligence process to leverage low-cost near-real-time OSINT. The USA is alone in its obstinant refusal to redirect funds from antiquated bureaucracies, processes, and technologies, to the modern combination of multinational multiagency, multidisiplinary, multidomain information sharing (M4IS, developed by Sweden). Congressman McCurdy and Senator Boren, Congressman Simmons, Admiral Studeman, Dr. Joe Markowitz, Mr. Boyd Sutton and a small handful of others have been laboring for 19 years, beginning in 1988 with an article published by the Commandant of the Marine Corps, to redirect national intelligence toward all information in all languages all the time, and toward the festering sources of instability that have now been ranked by the High-Level Threat Panel where LtGen Dr. Brent Scowcroft was the USA representative. The Smart Nation Act will lead to intelligence reform, acquisition reform, educational reform, enhanced productivity and reduced environmental damage across America, and it will set the stage for helping Brazil, China, India, Indonesia, Iran, Russia, Venezuela, and other Wild Cards (e.g. South Africa, Turkey) from repeating our Industrial Era mistakes. Every rocket is a flamethrower passing through the atmosphere! Maybe paved roads give off more heat per hour than 5 rocket launches. Ill tell you, we had one of those instant monsoons 2 days ago, and it was instant steam off the rocks, looked like the whole place was on fire. I will predict that north american volcanos will soon awaken. Maybe even lift the continental plate here in AZ, like it did sometime in the past. It was lifted 1400ft last time, Im seeing stuff along a faultline that runs along the cathedral mountain complex right next to where I live starting to twist and spread a few spires around, something has maybe changed the flow of magma under us here. Assuming that its a timed event that layed down a layer of volcanic rock every 30ft worth of layers, it goes from the top, white sands, then layers of red, then a thin layer of white ash, then a few more layers of red, then about a 2ft thick layer of basalt, then it starts over, here I see 3 different sections with the same patern, from top to bottom, 1400ft. Now if you go down into the grand canyon you can see 7 of these paterned sections, with the lava falls being the most recent. Its like that mud volcano, then magma just starts oozing out of the ground in places at a timed interval. Every once in a while I hear this super high pitched whine, maybe a piezo electric effect of rock being compressed or bent. The water that comes out of our well seems warmer than last year, and this year the rodents that live underground in the winter never came up, maybe got gased, even a couple dead spots on the lawn where maybe some volcanic gas is escaping, since I water those spots extra, they seem to dry out real fast and seem steamy or I feel more humidity over those spots. Attempts to step up international action on climate change among the Group of Eight industrialised nations are being strongly contested by the US. A draft of the proposed communiqué from the G8’s summit in Germany in June, seen by the Financial Times, shows the US is trying to weaken some of the starkest language on climate change. The US, which declined to comment, wants to remove all reference to the scientific prediction, contained in the original draft, that “beyond a temperature increase of 2°C, risks from climate change will be largely unmanageable”. US officials object to setting a safe limit on the global rise in temperatures that will result from climate change but the European Union wants to use such a safety limit as the basis on which to work out the safe limit of global greenhouse gas emissions, and thereby impose emissions curbs on most countries. The US would remove all reference to the emissions reduction requirements that the EU wished to include. A reference to the need to begin negotiations on a successor to the Kyoto treaty is also deleted, as is all reference to the United Nations. The draft document has been weakened in relation to the Intergovernmental Panel on Climate Change, which this year produced the most authoritative scientific assessment of the problem to date, showing that the world has until 2020 to reverse the trend of rising greenhouse gas emissions to avoid the worst effects of climate change. The statement was published in Berlin where Ms Merkel said the appeal should encourage the G8 to take firm action. When Desmond Radlein heard about Richard Branson and Al Gore's Virgin Earth Challenge, a contest in which the first person who can sequester one billion tons of carbon dioxide a year wins $25 million, he got out his pencil and began figuring whether or not his company was up to the task. Radlein is on the board of directors at Dynamotive Energy Systems, an energy solutions provider based in Vancouver, British Columbia, that is one of several companies pioneering the use of pyrolysis, a process in which biomass is burned at a high temperature in the absence of oxygen. The process yields both a charcoal by-product that can be used as a fertilizer, and bio-oil, which is a mix of oxygenated hydrocarbons that can be used to generate heat or electricity. Because the charcoal by-product, or "agrichar," does not readily break down, it could sequester for thousands of years nearly all the carbon it contains, rather than releasing it into the atmosphere as the greenhouse gas carbon dioxide. Along the way, it would boost agricultural productivity through its ability to retain nutrients and moisture. "I developed this rough back-of-the-envelope calculation of what it would require if one were to [attempt the Virgin Earth Challenge] with the agrichar concept," Radlein explains. "One would need about 7,000 plants each processing 500 tons of biomass per day, which is a large number, but it's not outside the bounds of possibility." Such facilities would produce four parts bio-oil to one part carbon sequestered, so it would rake in money as well as carbon. Radlein is not alone in his belief in this technology—last week in Terrigal, New South Wales, Australia, the newly formed International Agrichar Initiative held its first ever conference, which included 135 attendees from every corner of the globe. According to Debbie Reed, an environmental policy expert who organized the conference, keynote speaker Mike Mason of the carbon offset company Climate Care urged attendees to unify in an effort to apply for the Virgin Earth Challenge. He also encouraged them to submit their method to the United Nations's Clean Development Mechanism program, which is designed to transfer clean technology from the developed to the developing world. Although no officials from the U.S. government attended the conference, there is a nascent stateside movement pushing for adoption of agrichar. "[Democratic Senator] Ken Salazar of Colorado is drafting a stand-alone bill on this, and he may also promote it as part of the Farm Bill," notes Reed. The Farm Bill, whose terms are decided every year, determines what agricultural initiatives can be funded by the U.S. government. Inclusion in the Farm Bill would virtually guarantee subsidies for research and application of the agrichar process. In 2100, if pyrolysis met the entire projected demand for renewable fuels, the process would sequester enough carbon (9.5 billion tons a year) to offset current fossil fuel emissions, which stand at 5.4 billion tons a year, and then some. "Even if only a third of the bioenergy in 2100 uses pyrolysis, we still would make a huge splash with this technology," remarks Johannes Lehmann, a soil biogeochemist at Cornell University and one of the organizers of the agrichar conference. There are other perks: Increasing production of bio-oil could decrease a country's dependence on foreign oil. In the tropics, boosting soil productivity increases the number of growing seasons per year, which could help alleviate the pressure to deforest biodiversity hot spots. The new markets for agricultural crops, which would in effect become sources of fuel, could boost rural economies worldwide, just as the demand for ethanol has bolstered the price of corn. One calculation by Robert Brown, director of the Office of Biorenewables Programs at Iowa State University, revealed that if the U.S. adopted a cap and trade program in CO2 emissions like the one already in place in the European Union, farmers in the Midwest could almost double their income by using corn stover—the leaves, stalks and cobs that remain after harvest—to fuel pyrolysis. The use of char also promises to combat marine dead zones, like that in the Gulf of Mexico caused by nitrogen- and phosphorus-rich agricultural runoff. Char reduces the need for man-made fertilizers by helping the soil retain nutrients. In addition, it can be made out of the very same manure and sewage that would otherwise pollute the oceans. "scientists" does it take to screw in a light bulb? is UNscrewing our old light bulbs. There are more efficient ways to stay awake and productive in darkness...and scientists often have ideas as to how. Are 10 times better than CFs. CFs use mercury, and LEDs don't. CFS are like regular light bulbs when compared with LEDs. Oh , but they got to get rid of the mercury somehow, lol. Yes bushman, possibly it would be good to say the mercury is driving us treehuggers (not sure what we're called in the desert) crazy, and we're scuffling to work that out for recycling and disposal purposes. Richard for the welcome back. I find it hard to understand the mentality of those who deny science. I'm not referring merely to the Inhofes and Bush’s but to those who take it as a point of personal honor to deny manmade warming is occurring. Why take it so personally? After all, those who believe it is occuring believe we are in a state of emergency. They have a right to shout and scream. But shouldn't those who believe it is not occuring be more serene? And patient? And coldly level headed? Looking back those of us who are old enough can remember when many businesses and corporations objected to government "interference" when it came to the environment. And we can remember their rationales. Anyone objective in those bygone days could see they did so only to protect profits. They were not objective nor did they care about the rivers and streams they polluted. And they set the stage for today’s more sophisticated rationales and arguments. Today's corporate think tanks and the scientists they employ to disprove "establishment" science are only a modernized version of the same crude, anti-profit meddling logic we were offered thirty or forty years ago. And since then religion (James Inhofe) has also gotten into the act. True, science, mainstream objective establishment science, may be wrong. But that possibility does not demonstrate that it IS wrong. Or that it should be snubbed and dismissed. And that science has been wrong in the past does not lessen the likelihood it is right today. After all, science split the atom: look at the results. And science also proved the Sun does not circle the Earth. Science has often been right when it comes to the common-sense proof of the eye. What’s more, do we have a right to use our world, our environment, as a dumping ground for all our waste? For whatever we cast away? Whether it be industrial, liquid, solid, automotive, organic, whatever? Even if science is wrong shouldn't we carefully manage our environment, treat it with respect, and care for it? I'm back alright. And I started out with a sermon!!! at NCN have been central to its existence and extremely dedicated to the tribal campfire as humanity's altar of decisionmaking. Each man's cave and fire are what's sacred...and of course the weapons to defend them. Hobbes lives on! Even though it appears such a philosophy currently dominates the States and its policies, and in 8 short years has been computerized into a plan to take over what parts of the world its advocates haven't yet, this regress to Empire is not what Libertarians and our members seem to believe is yet suitable. We await their candidates or first shots of anarchic revolution. by a need to propel the economy onward, to cause obselesense on current items and taught subjects, and initiate and IMPOSE an entire new programme of living (with the appearance of giving way to anticapitalists). To quote a much used phrase in academia, To ReInvent Oneself, got to reinvent yourself they always say, people confess over weekend social gatherings, I got to reinvent myself: on TV they say, I am reinventing. GW is the establishment Reinventing. It is really great because, it will cover every single aspect of living. Such an act of caring. Truth is best however. If the Earth is intelligent, which we believe it is, then what is the solar system? Zero IQ? and what is the intelligence of the sun? zilch? what is the intelligence of Milky way galaxy? and of the universe, or all the universes? Do the reinventers really believe they can cheat the entire network of life? Let us focus on Sun Spots (of Fury) and try to cool our lives with reduction of linear time frame actions. It is China demolishing at a staggering rate the Indonesian forests (mega constant Biotime frame existences)for their unstoppable economic appetite. Jazzo - are you really treehugging? do they do church as well? PS: I am terribly grateful to know the contents of that Video on the media scientists getting the graph lines muddled up in sequence of importance ie Temps rise causing CO2 and NOT co2 causing Temps rise. Quinty has a point about those interviewees being personally offended on GW: I remember similar, when strange odd ball young Irish blonde was given air time for her angry denial of anything re Dianagate - why should she care, and how does she know there was no conspiracy? to the import of anyone else? What you call "science" is terribly relative. Instead of just 'manmade' why not go a little deeper and chart the militarys' involvement in 'weather war!?' It has been going on for a long, long time. But, hey, if ya wanna feel guilty? Be my guest. Science is the new Sacred Cow. But, actually, not so new and not so sacred and oh so very damned political! 21 May 2007 @ 18:40 by quinty : Guilty? About what? I don't own any SUV. Though we may all share in a collective guilt since we enjoy the products of carbon producing energy resources. Such as electricity. At least I do. Though I admit I lose no sleep at night over my collective guilt and participation. As I see it it is a matter of changing our societal infrastructure. And on that regard I am truly on the side of the angels. (I hope, I hope.) I’m all for a “Manhattan” project-like attempt to create a clean, non-polluting national infrastructure. So science is overrated? A "sacred cow?" Okay. Who or what then can take its place on the rating scales? Hard headed Capitalism? Numerology? Marxism? Alchemy? Scientology? What can replace it in the field of its specific endeavors? But I think science is worthy of some respect. Like every other human endeavor it has its ups and downs. But its successes are very impressive. Had the believers in the “scientific method” stuck to the traditional methods (rattles and chants) we may never have had penicillin. Can we risk the chance science is wrong about GW? I don’t think so. And as I said we don’t have the right to foul our collective nest anyway. We should try to keep a clean house. Guilt, shmilt: change will require a great deal of government pressure and leadership. Buying Energy Star bulbs (which we have here in our house) won’t be the answer. And we need to start with a president who understands the seriousness of the crisis. And your blanket statements are a bit out of kilter. What do you mean by "...science is worthy of respect... and "...science is wrong about GW..." etc.,? Science? You lump it all together in one gigoundous sum and call it science. I asked Rich how many scientists did it take to screw in a lightbulb because there are so many opinions fissiparous amongst so called 'scientists' that none of them can get it right. Maybe they should all go out and get real jobs and leave the world alone? Oh, would you mind giving me your definition of 'science' and your definition of 'scientist,' please? And, if you don't mind, your definition of technology (teknos + Logia) as well? PS: Rattles and chants as traditional methods? Really, quinty san, read the Maha Baharata sometime. And do, please, read the articles at the above sites. Ah, welcome back. Forgot to mention that, and I do, believe it or not, appreciate your discourse, and the dialogue engeandered, sometimes, here at jazzolog. above, some scientists seemed fairly honest - it was the film makers who kept the names of famous ones while removing all their remarks from the final cut, as being unsuitable to agenda! quite surprising to see honest scientists: so life is just as hard for them too! 1. The governments are pressing ahead with an agenda on false pretences. This time however the evidence is real, it is the reason which is quite wrong, the causative factor of GW. So they seek to address the wrong causative factor rather than just the evident warming itself. AND the forests are not included in the equation at all. Conclusion: the remedy is way off mark. 2. Two main facts: the Heating is on the surface only (not in atmosphere) which suggest two things. a) we are causing the heating by ourselves with design of towns, and machinery action, dishwashers etc etc; AND b) the solar wind is blowing away the ions which interact with air to make clouds, later rain. The forests also make rain by making the winds blow in certain directions only, making regular patters for crop growth and cooling the air with rain, and cooling from clouds shading etc. 3. My own remedy is to change all the tarmac roads plastered all around all our countries, change to vegetarian diet, with only a little meat say twice a week, with fish once a week for the diehards. Cows are a necessity because milk is the most important food in the world, it is what gives each of us that extra strength, and the butter is the most important cooling heater substance for the body, it is totally balanced and fulfills several functions in the body. If we do not have milk we could become like the Kalahari bushmen, eventually, or tortoises or something. 4. The reason for reducing meat eating is because it is extremely heating to the body, counteracted quite misleadingly by iced drinks (deadly, literally). The see saw action of these two substances wears away the body faster, until it can only manage on a little soup. Milk on the other hand is cooling. This is a very practical remedy to combat hot days. When developed into a regular habit, the hot days are withstood peacefully. 5 Design buildings which do not require so many light bulbs, which have shading, natural ventilation systems and thick walls for summer and winter. We are in for extremes. Concrete is a cooling substance (OK). 6. Women and children should not cut their hair. This interferes with the natural production of hormones from baby stage onwards, it is proven by other scientists which the west does not want to acknowledge until, it is suitable for it on its agenda, and then it will be sure to insist that it was the first discoverer of this pheno. Much of life would change if this custom was followed. People would be more beautiful naturally and cut out remedial expenses as the body would grow normally for each gender, and all else that follows from this would be like paradise, endless no sin apples. There is much much more of this natural science which one is shy to reveal, but it is basis of Handsome ness. (Note the Edwardian women all had long hair (brushed 20 times a night) and did not cut boys hair, even put them in petticoats until 6 or something with the girls). (The Entire Modern movement derived its initial impetus from this inheritence of healthy hormones and promptly made everyone cut their hair). The mind/body balances are most balanced when women particularly wear long hair, and young children do not cut theirs. After this every thing sorts itself out nicely, people happier, better decisions, etc etc. This is a summary of my understanding and a remedy. Crystalizing clarity makes for happy hopeful freed up people, shows a pathway however hazy reaching out for democracy. or we can smuggle you in through our immigration policy---speaking of "hazy." You'll be colossal help in his campaign. Paul's administration certainly will install Vaxen as Secretary of Defense. Nicola, you've saved the planet! the first thing I'll do when I'm president is go to Bob Jones Univeristy to recruit my staff. Then I'll check to see which convicted felons are available. Elliot Abrams and the like. And I'll see if any corporations need handouts. I mean, after all, where should the tax payer's money go but to our masters and betters? And I know a lot of corporations are hurting. Their profit margins may not have expanded since last year. Then I'll start an easy war, one we can win this time. One which will excite a great deal of patriotic fever and flag waving. But wait, hey, other than that last commendable goal we already have all this, don't we? So maybe I'll bring GWB into the White House for tips and consultations. I mean, I don't want to get off started in the wrong way. Right? Is our children learning yet? Define the terms of the debate! That's the way to go. Teachers are a special interest group! Education is big government! Public schools merely eat up taxes! But on the other hand George Bush demonstrates why our "elete" should go to Yale. Who are the greedy special interest groups? Women, blacks, minorities, children, students, labor and the like. No one would dare call a billionaire a member of a special interest group though. That's "class warfare." and something which certainly has never been contemplated, but accepted gratefully and who else for Sec for Defense, but our very own Ivan SkaVinsky SkaVarr to take on the Abdul em Bullbul emBhirs. Only the tune comes to mind momentarily for this epic song, will search, if Vax does't get there miraculously first!!! Merci Beaucoups, mes amis. or two..and was it really all seven? Maybe I can save you some time in case you didn't stream or channelsurf to glimpse concerts yesterday. And oh yes, how was the concert on Antarctica? I guess just one group performed, named Nunatak, for 17 research scientists and various obligatory penguins. I haven't scored a photo of it yet. I'll bet some of the thousands of fans in the 90 degree heat at Giants Stadium wished they were there. "11:30 PM: That’s it. Al Gore comes onstage and tells us to put a little bit of today in our hearts. We will Al, we will. Al bids us goodnight, as he and his team of a dozen Secret Service bodyguards pile into a fleet of hybrid S.U.Vs. and drive off into the musty New Jersey night. Is or was this "fiddling as Rome burns" or was anything accomplished more than the stroking of large egos? How does "unrelated music" save humanity and the planet. Or was it the "group or global hug" that was the point? I guess money was raised but for what or who? Well at least the Japanese event wasn't as "unconsciously hypocritical" as they did the "due diligence" and powered there site with solar power mind you it wasn't as "sensational" either then though which seems to suggest we've become way to "desensitized" to properly assess and address the whole issue and should perhaps turn it over to someone else who actually cares. "I'm afraid I'm with the 'just how much energy did these concerts to promote energy conservation use?' crowd. We all know that concerts are HUGE energy eaters - not to mention the garbage they produce! All that energy gone just to make us feel good ( we're the concerned people..... come on let's pat ourselves on our backs while eating up enough energy to power all the water pumps in an African town.)" Something there is in us that loves the ritual of a large gathering. Build a fire, find a drum or do the dance, and head for a mind altering experience. Some of us try to do that everyday, so maybe an emphasis becomes necessary from time to time through the gigantic. Did Woodstock do anything? It reminds me the Saturday morning of the Woodstock weekend, Ivy and I were driving along the Maine seacoast enjoying one of our favorite pastimes together. We liked to get in a car and just drive. If we didn't know where to go, we'd get out a map, choose a road, and just follow it. Crosby, Stills and Nash were celebrating Judy on the radio, and Ivy said, "Maybe we should go to Woodstock." The weather was nice in Maine, and I didn't know about rain down there or the fact we probably couldn't have gotten near the place by that time. But the point is we were just out driving around, neither of us dreaming that within our own lifetimes we'd see a diversion like that coming to an end. Yesterday I watched Pixar genius John Lassiter's requiem to the gasoline engine in his movie Cars. It's a very sweet piece and obviously an enormously personal one for its director. In the short documentary on the DVD that describes its inspiration, John barely can speak of the project without his eyes misting up and voice starting to tremble. Paul Newman, who plays a 1951 Hudson Hornet in it, obviously feels similarly...and yet few have led the way to a new global consciousness with more brilliance that Paul and Joanne Woodward. Al Gore declared a major goal was not to leave a huge footprint with these concerts. They used recyclables as much as possible, he said. I hope that's true and that it worked out somewhat. I know he uses a lot of energy in his life and work...and so does Madonna. Some people fly in airplanes to jobs here and there. In our home we try to limit fuel and water use to a degree that could be described as obsession. We're still on our own well. Bicycling is a viable method of transportation, and if you're 10 miles outside of town it means rescheduling bigtime. Maybe Live Earth can be seen as a lament of sorts...for the kind of living our civilization has encouraged over the last half century. That might be a way for us older folks to look at it anyway. For the young, hopefully a chord has been struck that environmental consciousness is OK. It's now the norm...and the way to think about everything we do. Ed's many interests are reflected at his homepage http://ed.jonas.googlepages.com/home . When Ivy isn't out on her mule looking for lost sheep, she sometimes still uses her ballet savvy creating productions like this one http://thomasschoolofdance.com/bangorballet.php . Each is among the most passionately concerned people about our Earth that I know. "got it" that there is a problem of sorts and there are actual things that can be done. I suppose I wonder though in such things if the real message is able to get through the noise and party, although in the haze of woodstock they say if anyone can remember it then they probably weren't there. lets put it down then as a rallying cry for the new day and a swan song for a passing party age. Hey is humanity maybe the mighty quin and magic dragon aside perhaps growing up. hmmmm Yea I suppose there is that point of having to grow up. so I hope we can thus grow up gracefully. A government report issued today raised the level of drought conditions in much of the Akron area and the state of Ohio. The U.S. Drought Monitor of the National Oceanic & Atmospheric Administration, in a report based on readings through Tuesday morning -- before this week's rainfall -- now categorizes conditions in portions of Summit, Medina and Portage counties as being in moderate drought. The weekly report said the northern half of both Portage and Summit counties and most of Medina County had moved from abnormally dry to moderate drought. Stark and Wayne counties remain in abnormally dry conditions, the report said. Most of the state is considered in moderate drought, and a small strip of southern Ohio is in severe drought. The U.S. Drought Monitor report said that 20 percent to 30 percent of the corn and soybeans were rated very poor to poor in Ohio, Indiana and Michigan. As of Wednesday evening, prior to today's rainfall, the National Weather Service reported that rainfall for the month of July was only 0.56 inches -- 1.77 inches below normal -- and rainfall since June 1 was 3.57 inches -- 2.31 inches below normal. Since Jan. 1, the weather service said, total precipitation as recorded at Akron Canton Airport was 17.50 inches, or 3.65 inches below normal. More rain is forecast throughout today. The "small strip" includes Athens, where our family attempts to keep our well going independent of increasing globalized control of water resources.